Audi says the H-tron quattro concept's aerodynamic design helps to reduce fuel use. INGOLSTADT, Germany -- Audi will lead Volkswagen Group's development efforts in emissions-free hydrogen fuel cell cars to better position the brand as a innovation leader, its executives said. Audi has assumed the lead function as the group's "center of excellence" for fuel cells. Its first fuel cell car could be an SUV previewed by the H-tron quattro concept unveiled at the Detroit auto show in January. 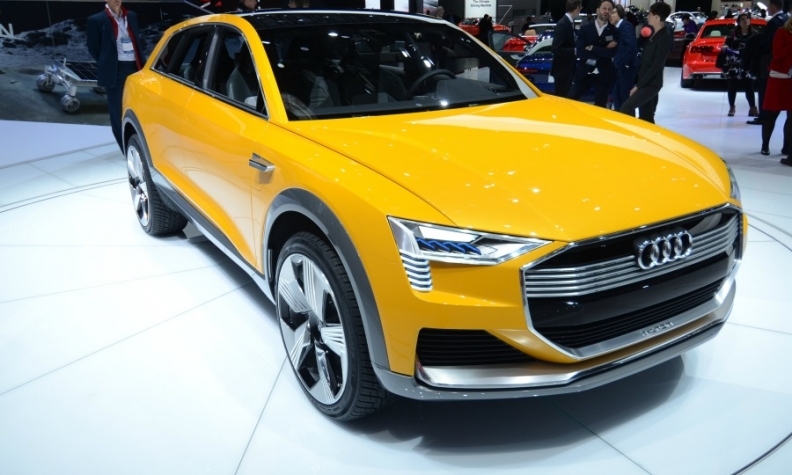 Speaking to reporters at the brand's headquarters here, Audi's new development chief Stefan Knirsch defended the need to invest in fuel cell technology even as electric cars begin to gain traction in the market. "I know there's a big discussion 'why fuel cells?' if everything in the future will be [battery] electric: at some point there will be a charging infrastructure and the electric ranges will increase, so who needs fuel cell cars? But we don't see it so black and white at the moment," he said at a press event. Knirsch believes one decisive advantage that fuel cell vehicles have over fully electric cars is the much smaller battery that is not just substantially cheaper to build but also far lighter, improving the vehicle's performance. In addition, fuel cell cars only take a few minutes to fill up, while battery powered cars can take hours to fully recharge, although the VW Group is aiming to reduce this to just 15 minutes with 800 volt technology. While no launch date was given, Knirsch said a future Audi fuel cell car would likely be similar in appearance to its upcoming electric car, which debuts in 2018 as a full-size SUV to benefit from the growing popularity of such vehicles. "We chose the body style for battery electric since we got very clear feedback from our markets that is what they need to gain volumes (including fleets) and it's also true that you can ask higher prices for such a car," he said. "We will adopt a similar approach for fuel cell cars." Audi is trying to reduce production costs by reducing the amount of precious metals used such as platinum, a common catalyst in Proton Exchange Membrane (PEM) fuel cell stacks. Nevertheless Knirsch declined to say what kind of price Audi's fuel cell cars might have at this early stage. "Naturally you cannot price them at 150,000 euros, unless you really don't intend to actually sell them," Knirsch said. Knirsch said Audi was already thinking one step further by solving the problem of procuring hydrogen. Although it is the most prevalent element on earth, hydrogen binds quickly to other atoms and as a result is not naturally found as a gas such as methane. Audi's plant in Werlte, Germany, produces hydrogen through electrolysis, an energy-intensive method by which an electric current is run across two poles submerged in water, splitting the liquid's molecules into hydrogen and oxygen gases. After receiving regulatory permission, the facility can now purchase the excess renewable energy to power the process, often generated from windparks, directly from utilities at times when prices are particularly low, such as the middle of the night. "We are certain that we will be able to offer hydrogen produced in a CO2-neutral way in the future," Knirsch said. Audi's H-tron quattro concept uses 1kg (2.2 lb) of hydrogen per 100km (62 miles). It has a range of up to 600km (373 miles). Its three hydrogen tanks are located beneath the passenger and luggage compartment but do not impinge on the interior, Audi said. The car uses VW Group's second-generation modular longitudinal platform (MLB evo) that also underpins the the E-tron quattro concept for a battery powered car unveiled at the Frankfurt show last September. Audi isn’t alone in developing fuel technology for series production. Mercedes-Benz plans to coordinate its launch of a fuel cell vehicle based on the GLC midsize crossover next year together with Ford Motor and Nissan in the hopes of spurring investment in a hydrogen filling station infrastructure.